GREATEST REGRET: Once discovered the meaning of life but forgot to write it down. Not much to say, compared to excitin’ lives like you folk out there. A scribbler and writer when life permits, a music and nature lover, geek, day-dreamer, arm-chair philosopher and random road-tripper… And a strangely hopeful cynic from many accounts. Started off as a writer at Maxim-India and some freelancing music/gig reviewer, I’ve since moved on to more fictional pursuits. Written comics for Holy Cow, Pop Culture Publishing and Comix.India and way back in the yore-days of 2013, founded Meta Desi Comics as a creator owned/friendly publishing imprint. Also, can’t stop coming up with strange new ideas so end up writing a fair bit of short fiction here online. Co-founded and was Editor/lead-writer for Comicaddicts.com from 2013, before work and life necessitated leaving and it shut down – but I continue to read and review comics as much as humanly possible. 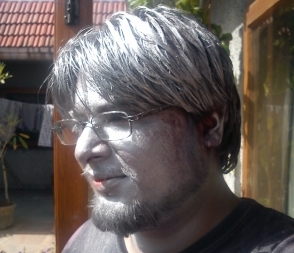 Also was part-time Indian Correspondent over at Bleeding Cool for a time. Love to let my mind wander and at times it takes forever to find its way home. Question for YOU: How can something be both “new” and “improved”? If it’s new, what is it improving? So if you’re willing to join me on my whimsical and somewhat meandering journey through the ins and outs of things in the world or simply need a place to laugh, cry, be amused and bemused and the like – then drop in anytime and grab a metaphorical (or literal if you prefer) drink with me and contemplate the vagaries and varieties of the world we inhabit. Just popping in to tell you about the 100WCGU. It is a weekly challenge which runs from Tuesdays 12.01 until the following Monday 11.59. One of the reasons for it is the limitation of wordage. One or two over is fine but not doubling plus. You use the prompt given either in it’s entirety or as a stimulus whichever is the task. It would be great to have you join us. Are you on twitter? I usually tweet the prompt out on Mondays. I’m @jfb57 if you are. Unfortunately I’m not on twitter but I can be reached on this blog, just leave a comment like you have here. The limited wordage is not a problem, just figured “no harm asking” so I guess I will participate starting from next week. Many thanks! Hope you enjoy the site itself as much if not more. Sounds interesting. I look forward to wandering through your site. Thanks for coming by mine. Glad to have you drop in, hope you enjoy your wanderings here. Just followed you. Looking forward to reading your work. Will comment as per the comment thread where I first was introduced to you. More than acceptable Doug, pleasure to make your acquaintance. Many thanks for dropping by and again, hope you enjoy what you see. Thanks for dropping by my blog. Hope you’ll try the 100WCGU over at Julia’s Place. Will give it a look and try to contribute on time – I think I did once already but was too late or not able to linkback properly or something. Drop by my blog for the details. Stalk away, I promise not to get a restraining order unless absolutely necessary! Hey, thanks for dropping by and commenting. I generally don’t give out my email address as a practice – you can leave me anything relevant here or in a private message on my facebook page, the link to which is on this blog itself. No problem. I’ll send you a message on Facebook then. Hey, would like to get in touch with you for a book review. A great blog… and yes I was amazed to find out that you have published a comic series!! And yes, I have published comics, not one but several and have recently moved from writing to publishing for myself and others. Thanks for the advice and thinking of me to help you out – though I’m over 30 so not quite young and not sure what you think I can help with but I’m around so be in touch if there’s anything I can do. I’m honoured to be listed there. Thanks! Would like to get our books reviewed by you. Drop a mail if you are interested. Can discuss other details through mail.